Do you ever feel lost or stressed when it comes time to start studying for final exams? I know a lot of my clients have over the years, and so I wanted to share with you all my favorite technique for how to organize your final exam study plan. In this video, I show you my favorite way to organize how to study for final exams and get it all on one page. And this, especially when you have multiple final exams, is very important as you have a LOT of details you have to prepare. So to start, you want to start about 3 weeks out, even if you haven’t received all your information for the final exams, and draw out on a sheet of paper a calendar as seen below. Basically, you want to start out with a blank sheet of paper or white board, and then draw a table that has 7 columns and 3 rows (or more or less depending on how many weeks out your finals are. 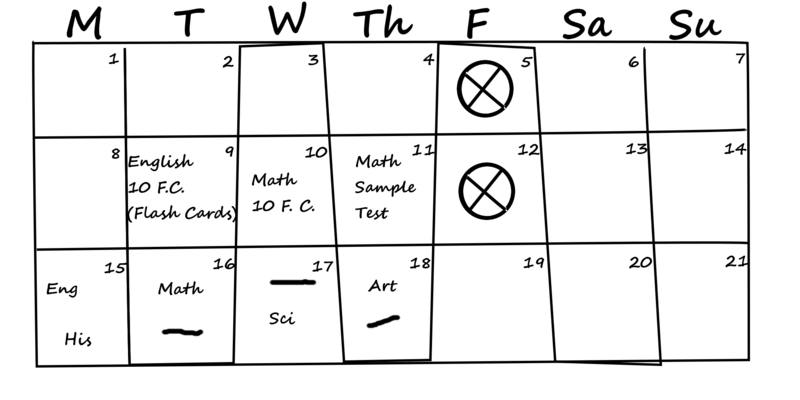 Then above each column put the day, and I like to start on Mondays and have the weekends grouped together. Then we want to number the days, so Monday the 1st, Tuesday the 2nd, etc. Next, on the final week we want to put in when our final exams are, so if you are in high school you likely have 2 exams a day and it might look something like above, with English and History on Monday, Math on Tuesday, Science on Wednesday, etc. 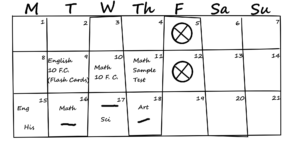 Then in the weeks prior we plan out what we are going to do to study. In the example above I said that on Tuesday we’d study English with 10 flash cards, math on Wednesday with 10 flash cards, and then take a math sample text on Thursday. And my final tip is to leave Friday’s empty that way you can really focus your studying on the weekends when you have free time and give yourself Friday afternoon’s off; because let’s be honest, no one wants to do anything on Friday afternoon. If you found this tip helpful, you can find a LOT more tips for studying and time management in my course, The Anti-Boring Approach to Powerful Studying, so please go check that out! Should You Remind Your Teen To Do Homework?